Hi! I am Jonie Lim from Malaysia. In this blog post, I would like to talk about the audio effects. This would be my 3rd week assignment for Introduction to Music Production. Basically, there are 3 major categories of audio effects, which related to the 3 properties of sound. I am going to take a plugin for each category, and explain how these plugins work in GarageBand 5. I have recorded a singing on 4 notes and export to mp3 with no audio effect being applied. Dynamic effects play with the amplitude of the sound. One of the plugins that put manipulate amplitute of the sound is compressors. Basically, a compressor would "squeeze" an audio signal when it rises above a specific threshold level. 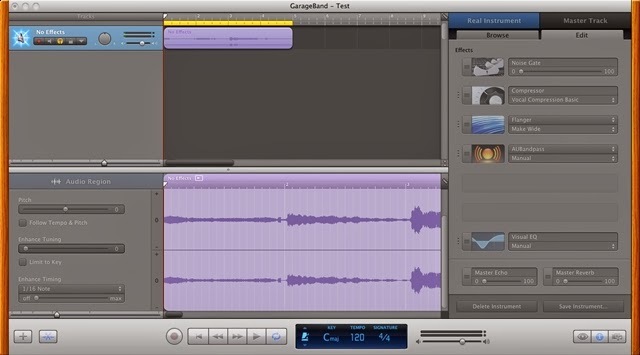 In GarageBand, it would then take the setting of ratio for the strength of the compression, attack setting for when the compressor should react to the signal breaching the threshold, and then the gain setting to set the loudness of the effect to the audio signal. See the screenshot below. I put on the effect to the audio earlier and mixed to mp3 again. Here's what you will get by applying the above setting to the original audio signal. To me, the effect is very mild. One way to "observe" the differences, is by the visualization of the mp3 file playing on the media player. Delay effects play with the propagation property of the sound. It provide the sense of space of the audio signal in the mix. One of the plugins for this is flanger. A flanger mixes a delayed same audio signal and the original signal together. Here's the setting I have applied to flanger to the original audio signal. The intensity setting is for how much the flanger effect applied to the mixed. The speed setting is for how much latency the "new" audio signal will be mixed to the original signal. The feedback setting is for how much feedback is applied to the modulated signal. Observed the difference of the following mixed audio with the original audio. Filter effects control the impact on the timbre/frequency of the sound. One of the plugins for this is Band Pass filter. It passes frequencies within a certain range and attenuates frequencies that is outside of that range. Let's see the example that I applied to the original recording. I set the bandpass filter to ~2.7kHz, and let the attenuations happen gradually around that frequency. In summary, I have prepared the table below. Dynamic Effect Amplitude Compressor Squeeze the audio signal when it is above a threshold value, which would reduce the signal dynamic range. This will results in a "flattening" of the sound. Limiters Boost the signal before the threshold and limit the audio signals that is out of the threshold. Expanders Amplify or attenuate the audio signal. Stereo expander can create a surround effects which can enrich the stereo field of a mono signal by creating spatial effects. Gates Only allow a signal to be heard if it exceed a specific volume threshold. This can be used to silence a constant low noise floor from a signal. Delay Effect Propagation Reverbs Apply echo effect to give a sense of the room size effect. Delays Apply delay effect on the original signal. Phasers Create peaks and troughs in the frequency spectrum and these effects are vary over time to create a sweeping effect on the audio signal. Flangers Mix a delayed signal to the original signal. Choruses Mix different pitched of the original signal. Filter Effects Timbre (Frequency) High pass filter Passes high frequency signals and attenuates frequencies lower than the cutoff value. Low pass filter Passes low frequency signals and attenuates frequencies higher than the cutoff value. Band pass filter Passes signals for frequencies within a certain range and attenuates frequencies outside of the range. Equalizer Boost or cut each frequency to control the frequency response characteristics.